a pack lasts for 3 months. This dietary supplement accompanied by the awareness of some well-explained directions in the ebook sold on this website can bring great satisfaction. I have taken this supplement for two months and have already ordered a second box. I think the benefits can be seen over time but it is absolutely the first step for those who want to recover their hair! My hair is for sure more vigorous! The quality of this product is definetly undeniable! I can now say that after constant use of this product for three months it is definetly the best I've ever tried. Unlike regular natural supplements this is the only one that works. The hair and the skin are in great shape, no more hairloss and a general regrowth. Moreover, there are no absorption or digestive problems, the price is appropriate to the product and its duration. Within a month of this product’s use I noticed a positive balance between hair fall and re-growth. My hair is stronger and has more volume. I hope it continues. Recommended! 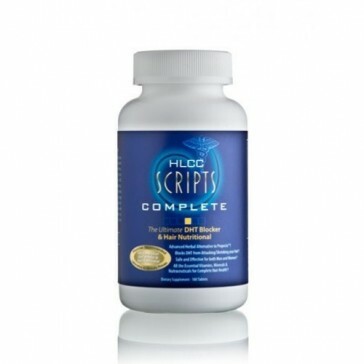 If you want more detailed information about this product, please search over the web for the manufacturers official page by inserting "Hlcc Scripts Complete" or contact our customer service. After a month I see a slight improvement. I am awaiting more results in the next coming months. I bought it for the very promising active ingredients. The results are expected after about 3 months of treatment. I started taking Complete Scripts for hair thinning about 4 months ago. I must say that I find it beneficial. I noticed a decrease in hairloss and a mild regrowth which had not occurred with any other product that I had previously used. I recommend it to anyone looking for a natural remedy for hair loss. and so on up until you take Finasteride once a week, and then you can only use Scripts Complete. NOTE: The saw palmetto, the main ingredient of the product, should not be consumed during pregnancy and those who suffer from anemia should be cautious, because it can reduce the absorption of iron, unless the field do not take it away from meals rich in iron. However in this case always consult your doctor first. Good product to stop hair loss. As far as regrowth after 4 months I do not see great results. I am using the product since 2 months and the outcome is positive. Let’s see how it goes after 3 months. A FRAUD !!! IT IS NOT WORTH IT !! NO IMPROVEMENT AFTER 4 MONTHS. ACTUALLY IT HAS GOTTEN WORSE : HAIR IS THINNER, HAIR FALL HAS NOT STOPPED AND NO IMPORVEMENT NEITHER IN HAIR QUALITY NOR IN HAIR THICKNESS. VERY DISAPPOINTING !!! I started taking Complete Scripts in September 2014 and, after about twenty days, I began to notice that I was losing less hair. Now I can say that the thinning has stopped completely and I no longer have hair on my pillow (besides physiological daily hairloss). One question: if the pack contains 90 tablets considering and directions are 2 per day does it last a month and a half ? Am I wrong ?